AS ONE OF THE LARGEST CLASSIC CAR DEALERS IN THE WORLD, WE HAVE MANY MORE VEHICLES LIKE THIS. PLEASE GO TO OUR WEBSITE. 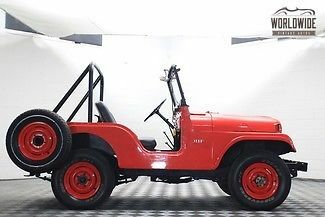 1955 WILLYS JEEP CJ5 4X4! RESTORED AND READY TO ENJOY! COMES WITH THE ORIGINAL OWNER’S MANUAL! THIS JEEP HANDLED GREAT ON OUR TEST DRIVE AND IS READY FOR DAILY USE! INSPECTIONS ARE HIGHLY SUGGESTED ON COLLECTOR, CLASSIC, RESTORED, AND MODIFIED VEHICLES. THESE INSPECTIONS SHOULD BE DONE IN PERSON BY YOU THE BUYER, ANY INSPECTION MUST BE DONE BEFORE BIDDING, OR PLACING A DEPOSIT. WE PREFER TO WORK WITH BUYERS OF DIRECTLY, NOT THIRD PARTY INSPECTORS (MOST OF THESE SERVICE INSPECTORS ARE TRAINED IN LATE MODEL VEHICLES AND THEIR INSPECTION TEMPLATES DO NOT APPLY TO CLASSIC OR ESPECIALLY MODIFIED VINTAGE VEHICLES). WE HAVE SALESMAN AVAILABLE SIX DAYS PER WEEK TO INSPECT ANY VEHICLE. WE HAVE A DEDICATED 2 POST LIFT TO PUT ANY VEHICLE UP IN THE AIR FOR YOU TO MAKE SURE YOU ARE 100% COMFORTABLE BEFORE BUYING. IF YOU WOULD LIKE TO MEET AN INSPECTOR AT THE DEALERSHIP WE WILL ACCOMMODATE BOTH OF YOU. WE CANNOT DRIVE EVERY CAR LONG DISTANCES. WE ALSO CANNOT GUARANTEE THAT EVERY GAUGE, LIGHT, OPTION, FUNCTION, ETC... WORK. WE DO OUR BEST TO INSPECT THESE VEHICLES IN DETAIL. ALSO PLEASE NOTE, WE USE OVER 75 HD PICTURES FOR EVERY ONE OF OUR LISTINGS IN ADDITION TO A VIDEO INSPECTION. VERY FEW COMPANIES OFFER THIS MUCH DETAIL. WE DO OUR VERY BEST TO DESCRIBE THESE VEHICLES IN ADDITION TO THE VISUAL ASPECTS, BUT WE ARE NOT YOU. IF YOU WANT TO COME AND INSPECT THE VEHICLE WE HIGHLY SUGGEST IT! THE INFORMATION CONTAINED IN THIS AD IS SOLELY FOR CONVENIENCE. THE DESCRIPTION IS AN OPINION ONLY, AND SHOULD NOT BE CONSIDERED A COMPLETE DESCRIPTION OF ANY OR ALL FAULTS, AND MAY NOT BE RELIED UPON, TAKEN AS FACT OR OTHERWISE CONSIDERED A REPRESENTATION OR WARRANTY OF ANY SORT. THE VEHICLE IS SOLD AS-IS, WHERE-IS WITH ALL FAULTS KNOWN OR UNKNOWN AND WITH NO IMPLIED WARRANTY. -WE DO NOT RECOMMEND DRIVING A CLASSIC CAR HOME. -OLD CARS ARE JUST THAT, OLD CARS. YOU NEED TO SHIP IT HOME. OUT ON THE ROAD, MANY MILES FROM HOME IS NOT THE PLACE TO GET FAMILIAR WITH YOUR OLD CAR. OBVIOUSLY WE CANNOT STOP YOU, BUT THIS IS OUR RECOMMENDATION. -MILEAGE IS EXEMPT. UNLESS WE HAVE SOME DOCUMENTATION WE ALWAYS SELL CLASSIC CARS AS MILEAGE EXEMPT. THAT MEANS WE DO NOT KNOW THE ORIGINAL MILES. WHAT WE LIST IN THE AD IS WHAT THE ODOMETER CURRENTLY READS OR IS BASED OFF REBUILD INFORMATION, PROVIDED BY THE BUILDER AND CANNOT BE USED AS FACT, OF THE ENGINE AND OR BODY/CHASSIS. ALSO, YOU CANNOT DO A CARFAX OR AUTOCHECK ON ANY VEHICLE OLDER THAN A 1981. THIS VEHICLE IS BEING SOLD BY WORLD WIDE VINTAGE AUTOS. THE BUYER IS SUBJECT TO A $399 DEALER FEE. THIS FEE PAYS FOR A 60 TEMPORARY TAG, BRAND NEW COLORADO CLEAR TITLE, VIN VERIFICATION OF ALL VEHICLES TO ENSURE NOW SURPRISES, AND REGISTRATION OF YOUR VEHICLE. THE VEHICLE IS SOLD AS-IS, WHERE-IS WITH ALL FAULTS KNOWN OR UNKNOWN. We do our very best to accurately describe every vehicle we sell and represent them with 100% integrity. We SPEND a lot of time testing what works, and what doesn’t. Please note that occasionally old cars can have anything quit working at any time. Vehicle is sold “As Is” with no warranty. When calling JJ Best Banc, please reference our dealership World Wide Vintage Autos to get our representative. We use the Central Dispatch carrier program and we do this because any carrier that wants to be affiliated with them has to licensed, insured, and bonded. This is to protect your vehicle up until you recieve it. WORLD WIDE VINTAGE AUTOS IS A LICENSED AND BONDED CLASSIC CAR DEALERSHIP HEADQUARTERED IN OUR OWN 40,000 SQUARE FOOT INDOOR FACILITY IN DENVER, CO.
WE ARE ABLE TO BUY LARGE CLASSIC CAR COLLECTIONS, ESTATE SALE AUTOMOBILES, BANKRUPTCY LIQUIDATION VEHICLES, AND SO ON AT SIGNIFICANT DISCOUNTS. THESE DISCOUNTS ARE PASSED ALONG TO YOU! NO ONE CAN BEAT OUR PRICES AND QUALITY. AFTER SELLING HUNDREDS OF CLASSIC VEHICLES, WE UNDERSTAND THE PROCESS AND WILL ENSURE THAT YOU HAVE A PLEASURABLE EXPERIENCE. CHECK OUT OUR 100% POSITIVE FEEDBACK RATING! LET’S FACE IT, THESE CARS ARE TANGIBLE INVESTMENTS AND HISTORICALLY HAVE PERFORMED BETTER THAN MOST INVESTMENT ALTERNATIVES. INTERNATIONAL BUYERS: WE HAVE SOLD AND SHIPPED VEHICLES ALL OVER THE WORLD AND HAVE HAPPY CUSTOMERS IN CANADA, EUROPE, AUSTRALIA, NEW ZEALAND, JAPAN, SOUTH AMERICA AND THE MIDDLE EAST JUST TO NAME A FEW. NEED A REFERENCE IN YOUR COUNTRY OR A SHIPPING QUOTE? FEEL FREE TO ASK. WE CAN ASSIST WITH THE TRANSPORT TO YOUR HOMEPORT AS WELL AS THE REQUIRED EXPORT/IMPORT PAPERWORK.